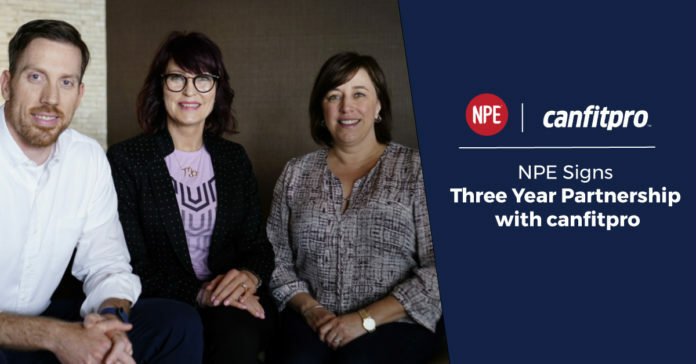 Global fitness business coaching company NPE has signed an exclusive three-year partnership with canfitpro, the largest provider of education in the Canadian fitness industry. The partnership offers canfitpro’s 25,000+ members access to NPE’s education, tools, and coaching, in addition to the certification and professional support offered by canfitpro. canfitpro certifies more than 10,000 fitness professionals each year. NPE helps fitness professionals and business owners grow their business and create the life they want—and since 2006 has served over 36,000+ fitness businesses in 96 countries. To compete, Canadian fitness professionals will need to both provide greater value in fitness training and sharpen their business skills. The canfitpro and NPE partnership is designed to help Canadian fitness professionals develop the range of skills needed to compete effectively against this pressure from international brands with massive marketing budgets. High on the list of fitness professionals’ priorities should be a clear idea of their vision and purpose. The NPE partnership with Canada will include CEU-approved business courses, such as AUTO-CLOSER®, the Fitness Industry’s #1 Sales System. NPE will also be presenting at this year’s canfitpro world fitness expo, the world’s largest fitness professional education event. It draws more than 5,000 fitness professionals and business owners and more than 20,000 consumers. The Metro Toronto Convention Centre is the only location in Canada big enough to hold an event of this size. Learn more and register for the event at www.worldfitnessexpo.com.